FIXYOURTHINKING.COM / Need a brain? Borrow mine! : Rebrander Rebadged With Out Of Business Sign: Why Minolta Leaving The Camera Biz Is A Good Lesson For Apple. Rebrander Rebadged With Out Of Business Sign: Why Minolta Leaving The Camera Biz Is A Good Lesson For Apple. Apple has done it ... and many big businesses do it. Rebrand. What do I mean by rebrand? The key is, Apple has never done it under Steve Jobs. Steve ended all rebranding when he returned to Apple. Big news today from someone you probably never knew was a rebranding company: Minolta. I could see troubled times ahead when Minolta merged with Konica back in August of 2003. If you look at this article, it will show you that more than just the camera business was troubled at that time. Konica was a low end camera manufacturer. The merger didn't make sense. Ever since the two merged ... there has been job cut after job cut announcement. The merger was like Mercedes buying Hyundai. In the 90's - Minolta started to rebrand more than innovate ... one example was their foray into camcorders that were simply JVC rebrands. Eventually, they started using camera bodies for their film cameras from all sorts of manufacturers. So, I want to relate this back again to the Apple realm of business ... I have a number of customers in my Apple Tech biz that have Minolta DSLRs ... I wanted to reassure all of them who are reading ... I hear Canon makes a nice camera! But you might want to steer clear of Nikon ... they might be next on the chopping block. Does anyone remember the 80's Minolta TV ad? It had a ping sound similar to the Intel Inside Ads and carried the catch phrase: "Only from the minds at Minolta"
Jackwhispers... you may know your Apple macs and Wintels but PLEASE don't embarass yourself by talking about the camera world. Forget each company's past history. In the digital era, prior to their merger, Konica only had a handful of p&s digicams. Minolta had about 20. (you can check the fact in the very respected DPRview site). After the merger in 2003 (I think), KM produced the 7D and 5D DSLRs with anti-shake in the DSLR bodies. Now, aside from the fact that Minolta innovated some of the modern technologies we take for granted in SLR/DSLRs today... what DSLR did KM "re-badge" to get anti-shake in the DSLR body? To date, not even Canon/Nikon or any other DSLR maker has this feature in their DSLRs (they tack it on to very pricey lenses instead)... and the in-body anti-shake system is even featured in KM's higher end prosumer digicams. Again, what product did KM re-badge to get this feature? 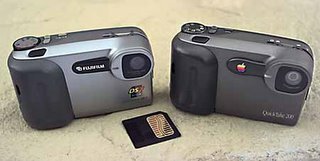 All other digicam makers (e.g. Panasonic) provide the anti-shake fature in the LENS. Please read the KM DSLR forums over at DPReview for an informed take on why KM pulled out of the camera and film market. Believe me, "re-badging" isn't one of them.